LTHForum.com - Coke: Get It In Glass? Coke: Get It In Glass? LTH Home > Chat > Shopping & Cooking > Coke: Get It In Glass? So, have any LTHers seen these anywhere?? I used to see Coke in a Glass bottle in ethnic mexican grocers. Dont know if they still carry the glass bottled variety though, but it may be worth a check. We picked one up at what used to be Jimmenz Market on Western at about Armitage (last Saturday). I think it may be David's Market now??? I had to check to make sure it was not a "Hencho in Mexico" like they sell at the Maxwell Market. pdaane wrote: We picked one up at what used to be Jimmenz Market on Western at about Armitage. I think it may be David's Market now??? Actually, I'm often disappointed in the Mexican Coke. Some of it seems to go through a lot in getting here, resulting in off flavors. My suggestion would be to try mexican grocers. It seems to me that the coke in glass is being fairly heavily marketed to that demographic -- about 75% of the billboards I've seen have been in spanish. So try the big supermarkets like Jimenez and Cermak and such. A few of the food stands at the Maxwell Market, including Lencho's, serve Coke in bottles. crrush wrote: A few of the food stands at the Maxwell Market, including Lencho's, serve Coke in bottles. Yes yes, but isn't that all hecho en Mexico? What's new is that Coca Cola America is now selling US-made coke in glass bottles. And they're hard to find, too..
gleam wrote: My suggestion would be to try mexican grocers. It seems to me that the coke in glass is being fairly heavily marketed to that demographic -- about 75% of the billboards I've seen have been in spanish. A lot of them were in Spanish, but I saw enough in English to not make the connection. But it's all starting to make sense...Coca-Cola America is aware that imported coke in glass from Mexico sells well in Hispanic neighborhoods...they're not happy with that (vaguely recall some articles about mexican coke mentioning that fact - i'm sure googling will dig some up), so they finally came up with an idea - to sell american coke in glass bottles in hispanic neighborhoods. Anyway, I'll certainly direct my search to Hispanic stores/markets. Although if that's the only place to find them, I might as well get the mexican Coke. I was really hoping that the glass bottles would be widely available at places like Jewel & 7-11... but thanks for the tips! clogoodie wrote: Anyway, I'll certainly direct my search to Hispanic stores/markets. Although if that's the only place to find them, I might as well get the mexican Coke. My Canadian wife really prefers mexican coke to American Coke. She says it reminds her more of Canadian Coke. I've had enough Canadian Coke to say I think she's hallucinating and that it's virtually identical to American Coke, but, hey. It makes her happy. The only reported price I saw was in that Bevnet.com thread I linked to in the original post - $0.99. I can't see them being priced less than that...but 50 cents would be great! They had quite a few cases of these, although they were in the aisle with the refrigerator cases of cold drinks, not the actual soda aisle. I'm partial to the Mexican Coke, myself. It's made with real cane sugar instead of corn syrup. I like that taste and I amy even drink one once in a while as opposed to never for American Coke. Agreed, my g/f and I enjoy mexican Coke far more than the US variety, and that goes for the mexican versions of Sprite, 7UP and Squirt as well. And all come in glass bottles as well. Though I must say Coke w/Lime is fan-freakin-tastic! Though lately we've been on a kick trying sodas from all over the place. Current favorite is Club Rock Shandy from Ireland. Oh boy that's a refreshing drink with bit of citrus pulp! yum. The glass bottle is a nostalgic draw for me though and I'd like to say I can taste a difference between pop in glass v. plastic, but have never actually sat down and tested this. Moses supposes his toeses are roses, but Moses supposes erroneously. Moses, he knowses his toeses aren't roses, as Moses supposes his toeses to be. All other things being equal, Coke in glass and Coke in plastic will taste the same; unfortunately, things are often not equal and glass preserves the flavor much better than plastic, which is permeable and, if not well handled, can allow the contents to develop off flavors much more quickly, as well as sometimes imparting its own flavor as the plastic degrades. Even glass, however, isn't necessarily protection enough for badly handled pop. Like many, I prefer sugar-sweetened Coke to the corn-sweetened variety. The difference isn't so much flavor as mouth-feel, though in a sense sugar-sweetened Coke tastes "brighter" than the more viscous corn product. However, I often find that Mexican Coke has been maltreated in its journey north. Glass won't protect it from being exposed to overheated conditions, for example, or too long a time in the bottle and then it develops a funky taste. Also, based on the bottle labeling and what my palate sometimes tells me, some Mexican Coke has corn sweetener, too. I usually stock up on kosher-for-Passover Coke in the spring. Then you can be sure of getting reasonably fresh sugared Coke, although, unfortunately 2-liter plastic bottles are typically the most readily available format. Kitchen Monkey wrote: Though lately we've been on a kick trying sodas from all over the place. Current favorite is Club Rock Shandy from Ireland. Oh boy that's a refreshing drink with bit of citrus pulp! yum. The original Fresca was cloudy and had bit of pulp. So I am quite intrique by this Irish Club Rock Shandy ... where did you find it? Wall Street Journal wrote: Coke has begun allowing Arca to ship small quantities of Mexican Coke to the U.S. as part of a test in Texas, according to Coke, Arca and CCE, the Atlanta-based bottler. The bottles are handed over to CCE for delivery to stores. The trial started in September in San Antonio and was recently expanded to some other Texas markets. Coke has no current plans to expand the program. 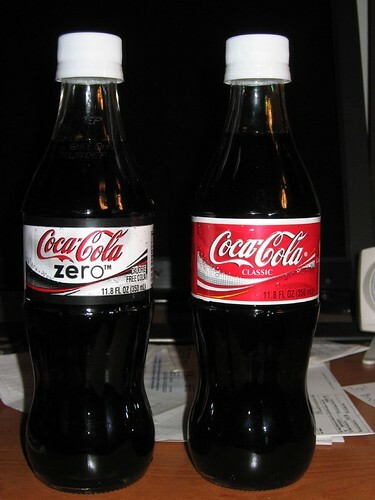 Of course, I was reminded yesterday that Coke and other sodas have been readily available to foodservice outlets in 10-ounce glass bottles for years. While the iconic soft drink has been on the market since 1886, only since 1935 has it been certified kosher, including for Passover. This is a great and short piece.